Abortion is such a horrific, gruesome part of our society, that its victims are rarely spoken of (by people on either side). And so these little Holy Innocents have become strangers for whom there is no room at the inn. They are forgotten. They have no voice. No more. This heartbreaking and moving booklet gives voice to the victims of abortion, and makes it impossible for us to forget these little strangers. While the images will bring tears to your eyes, the meditations written by Pro-Life warriors Joseph Scheidler, Jill Stanek, David Daleidan, Fr. Frank Pavone, Mark Harrington, and Abby Johnson, among others provide us with a means to bring this devastating reality and those abundant tears to God. With His grace, they will inspire us to carry out works of mercy in the service of life, and to never stop fighting for these little strangers. 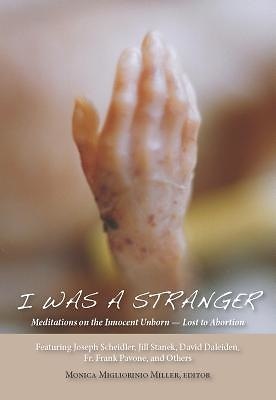 Edited by Monica Migliorino Miller, author of Abandoned, I Was a Stranger is a collection of seventeen meditations by those who have been battling abortion for years, and have seen its bloody fruits with their own eyes. effective acts of penance to"